13 It was before Passover, and Jesus knew that the time had come for him to leave this world and to return to the Father. He had always loved his followers in this world, and he loved them to the very end. 2 Even before the evening meal started, the devil had made Judas, the son of Simon Iscariot, decide to betray Jesus. 3 Jesus knew that he had come from God and would go back to God. He also knew that the Father had given him complete power. 4 So during the meal Jesus got up, removed his outer garment, and wrapped a towel around his waist. 5 He put some water into a large bowl. 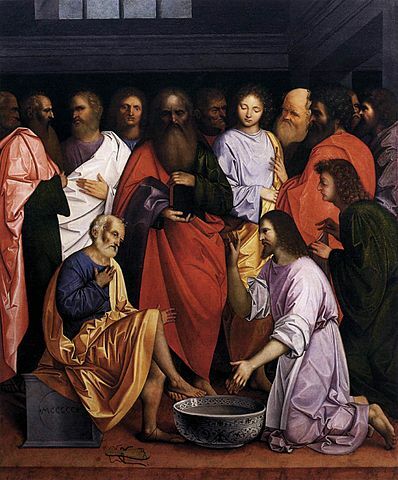 Then he began washing his disciples’ feet and drying them with the towel he was wearing. Do you understand what I have done? 13 You call me your teacher and Lord, and you should, because that is who I am.14 And if your Lord and teacher has washed your feet, you should do the same for each other. 15 I have set the example, and you should do for each other exactly what I have done for you. 16 I tell you for certain that servants are not greater than their master, and messengers are not greater than the one who sent them. 17 You know these things, and God will bless you, if you do them. 33 My children, I will be with you for a little while longer. Then you will look for me, but you won’t find me. I tell you just as I told the people, “You cannot go where I am going.”34 But I am giving you a new command. You must love each other, just as I have loved you. 35 If you love each other, everyone will know that you are my disciples. That is the servants job. and pours out his love for me. And he needed to do it. gently swabbing my aching body.